Tior alicti iusant utatur? Fici aut as ipsum, optate rendia aut evenis del mint landellibus adiciandae molentectaes repediste prere, incia cus des elestrum sequatiorent invernate dolor as excea doluptaquiae pa eum ad et re nis ex et estibeatibus voluptate soluptat que ducillabor autem et as dolut alicit alitae rehentibus, solessint ipsandis quibus experianiam haruptatatin. Savvyboater offers a wide range of covers from two of the top boat cover brands, Carver and Westland. Carver covers are manufactured in the USA and Westland covers are manufactured in North America, so lead times are generally short and finish quality is high. Both brands offer top quality boat covers in an array of high-quality fabrics and fit options. The fit you choose for your boat cover will depend on your needs. Our custom boat covers are designed specifically for the make, model and year of your boat. This choice is excellent for travel, storage and mooring and has padded reinforcements at key stress points for added durability. If you are looking for a slightly more economical option, our semi-custom boat covers are a great alternative as they can also be used in trailering, storage and mooring. These covers are not customized to your specific boat but are designed and fitted to your boat style, length and width. Additionally, Carver offers an assortment of universal fit boat covers that are excellent for storing your boat but are not recommended for trailering or mooring. Both brands offer boat covers for the most popular boat styles like pontoon boats, tournament ski boats, and wide bass boats and for less common styles like day cruisers, tri-hulls, and jet boats. All Carver covers do come with free tie-downs and storage bag with support poles offered as popular options. Westland offers free tie-downs with the purchase of one of their custom boat covers. To find the right boat cover for your boat simply input your boat’s make model and year into our boat cover finders or select the type of boat you have for covers designed for that boat style. Be sure to follow our measuring guidelines for a great fit and select a fabric that’s ideal for your climate. See our Help Guide below for additional information on choosing your boat cover. Not sure where to start? Our help guide explains some of the most important factors to consider when shopping our boat covers for sale. If you still have questions, please contact us for help. **Please note that trailerable boat covers must be installed correctly and properly tied down to prevent damage to your boat or your boat cover. 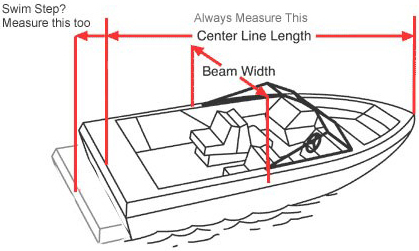 You will need to know the centerline length (from tip to tail) and beam width (side to side at the widest point) of your boat. Measure the entire distance in a straight line without measuring up or around obstacles or by following the curve of the boat. Don't rely on an owner's manual for accurate measurements. Factor in the dimensions of any additional features that will affect the cover such as a trolling motor, center console, jack plate or aftermarket pulpit, anchor davit, or swim step*. *If you have a swim step, measure just for the length of the step. You will add this length to the centerline length or keep it as a separate measurement for covers that fit the swim step. Keep your boat cover from sagging and collecting snow and water build up that can cause tearing, mold and mildew. Even fabrics recommended for humid environments will need extra ventilation. Thread the buckle end of the strap through the loop on the cover from back to front. 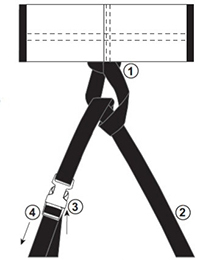 Pull buckle end out about a foot and tie with an overhand knot. Wrap the long end (without the buckle) down around the beam on the trailer from back to front. Continue to take the end up and thread it through the buckle from back to front. The strap is now fully adjustable by pulling on the loose end of the buckle to tighten. Mix and apply to mildew spots, letting it sit for no more than 10 minutes. Scrub with a soft bristle brush and rinse well, allowing the fabric to dry completely. Fully wet the fabric and then scrub it down with a soft brush or cloth. Give your boat cover a good rinse, and allow the fabric to fully dry. Get tough spots clean with Fabric and Vinyl Cleaner. Apply Fabric Guard to the clean, dry surface to protect your boat cover from the elements and extend its life.